La Jument is the name of a lighthouse at the Northwestern part of Brittany, France. The lighthouse is built on a rock (also called La Jument) about 300 metres from the coast of the island of Ushant(Ouessant), in the middle of the ocean. There is also a very different lighthouse about 3 kilometres to the North: the Nividic lighthouse. They are, together with the Kreac'h lighthouse, the three most famous lighthouses of the region. This section of the coastline of Brittany, on the west coast of Northern France, had always been known by sailors to be a rugged and dangerous area. Being the westernmost point of land, it is a heavily trafficked sealane, and experiences severe weather during much of the year. As such, the area has experienced many shipwrecks over the centuries. One such accident, the wreck of the steam ship Drummond Castle in June, 1896, was responsible for the deaths of nearly 250 people. Between 1888 and 1904, thirty-one ships were wrecked there. Plans to build a lighthouse on La Jument started not long after the wreck of the Glasgow-built steam ship Drummond Castle in 1896. The building works were privately financed by a wealthy Frenchman who had almost died in another shipwreck. Construction began in 1904 but the lighthouse could not be finished until 1911 because of the sea's often challenging weather conditions. 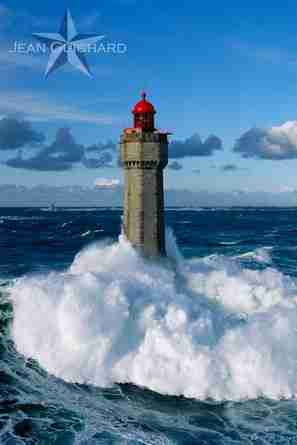 The lighthouse became well known in 1989 through a series of photographs taken by Jean Guichard. Over the past century, La Jument lighthouse has effectively increased maritime safety in the area, known to the Bretons as Mer d'Iroise or Iroise Sea. However, the waters off Brittany's west coast still remain one of the most dangerous seas in Europe with frequent violent storms, huge waves and strong currents. One of those infamous storms on the Iroise Sea happened on 21 December 1989. A front of low pressure coming from Ireland brought gale force winds and huge waves 20 to 30 metres high which crashed spectacularly against the lighthouse. The waves smashed through the lower windows of the lighthouse, ripped off the front door, flooded the tower and washed away the furniture. Lighthouse keeper Théodore Malgorn decided to take refuge up in the lantern room while waiting to be rescued. At that very moment, a giant wave rose over the rear of the lighthouse and Guichard took his world-famous shot as the wave smashed against the tower. Théodore Malgorn, suddenly realising that a giant wave was about to engulf the structure, rushed back inside just in time to save his life. Jean Guichard's 1989 dramatic storm photo shots became an instant hit and earned him the World Press Photo award. La Jument appeared in newspapers and magazines all around the world and Guichard went on to publish a best selling book about lighthouses and a collection of poster prints. Lighthouses in Brittany have been automated in the past decades and La Jument itself hasn't had a keeper since 1991. For many years, Jean Guichard's quest was to portray Brittany's maritime heritage before automation took over. Many of his photos are now considered to hold historic value and his work is highly respected in Brittany. As Cornwall is to England so Brittany is to France. The people have their own coastal culture, a fiercely independent lot, and this stretch of shore does suddenly become fearsome. At the very tip of Brittany, like a defiant finger pointing out at the Atlantic, this is the district of Finistere. With a of schoolboy French, you understand the meaning of the name. 'Finis' is the French word for the end, and '-tere' (terre) is Earth, so Finistere -the end of the Earth. The full fury of the Bay of Biscay itself here, whipped up by the Atlantic airstream. These aren't storms. Often in the winter months, these waters boil. Here, the mouth of the English Channel has swallowed many ships. This sea has spawned an awful lot of lighthouses. There was a time when I wanted to be a lighthouse keeper and people used to say, 'What a boring job,' but I beg to differ. Look at that lighthouse ! What can possibly be boring about a life like that? This photograph of La Jument lighthouse was taken in 1989. It became one of the world's most reproduced images and made a reluctant star out of the man at the eye of the storm. A lot of people thought that he must have died just a few seconds after the photograph, by that wave, but he survived and I'm going to find out how. Apparently, that lighthouse man has always wanted a signed copy of the photo, so we're taking him one. I'm hitching a lift with the man who made him famous, photographer Jean Guichard. In 1989, Jean set out to capture the end of an era. La Jument was about to be , as were all the lighthouses on both sides of the Channel. This was a tough posting, so it was particularly poignant to capture an image of its keeper for posterity. On duty that day was Théodore Malgorn. He now lives on a nearby island, having never really in on his fame. I don't think you sign up to be a lighthouse keeper so you can be famous. But we've got a photo to - it's only taken 20 years! I'm told Bretons are not known for great displays of emotion. But I think he likes it. Time to try out that schoolboy French. Signed and delivered. - Très bien. Ca va suffire, très bien. But I'm curious to know what it feels like to be possibly the most famous lighthouse keeper in the world. How does it feel for you, Jean, to have that image? - You know I feel to have the lucky photographer who did a great picture and after that this is something which is not really my picture, it's a picture of the lighthouse keeper and the lighthouse story in the world. Now that way of is gone. And now all the keepers have gone from the lighthouse and that's the end of a... of a story, you know.